I wrote this pattern for someone who already knows how to knit, but needs extra help reading the pattern. Click on the link below to get the free PDF pattern. Correction in pattern: On page 4 of pattern, row 6 instructions, the K2tog should say to knit front and back in the stitch before and after the markers. So sorry about this. I hope this didn’t mix anyone up. Thanks, Lisa, for letting me know. Your welcome. Would love to hear how the pattern works for you. Hi Pat. It’s so kind of you to let me know that my pattern worked out for you. Thanks for sticking it out even though you hit a few snags. Hi Cindy! I love this pattern! I have made quite a few of these and will continue to make more! I bumped the needle sizes up to 3 & 4 instead of 2 & 3 to make a sweater that is a bit longer in length and sleeve length. I have a hybrid doll, Gotz head and Battat body and she needed it to be a bit bigger! I am trying it with smaller needles for the cast on and 1×1 ribbing at the neck, like a size 2. I like it because it is 1. Simple and 2. Fun to embellish. It’s a great pattern for adding some embroidery or other other add ons. Thanks! Im a great fan! Wow! Sounds like you’ve become a cardigan sweater whiz! They are addicting, aren’t they? I appreciate (so much) letting me know how much you enjoy this pattern. Here’s to many more sweaters coming off of your magic needles!!! Hi, this is a cute pattern and I’m just getting started on it. I’m curious about something though. You said that Row 1 is a wrong side (purl) row, and that you prefer to keep your right side (knit) on the even rows. So you said you do the buttonholes on even rows 4, 14, 24, etc because they are right side rows. Yet Row 1 of your pattern is a knit row. Its not a big deal, I can just do the buttonholes on rows 3, 13, 23, etc. if I want to do them on a knit side, but I was just wondering if I misunderstood something. Hi Mary, It’s a garter stitch edge (knit on wrong side) to prevent curling of the fabric. Please make sure and note the errata which is located by the download link. 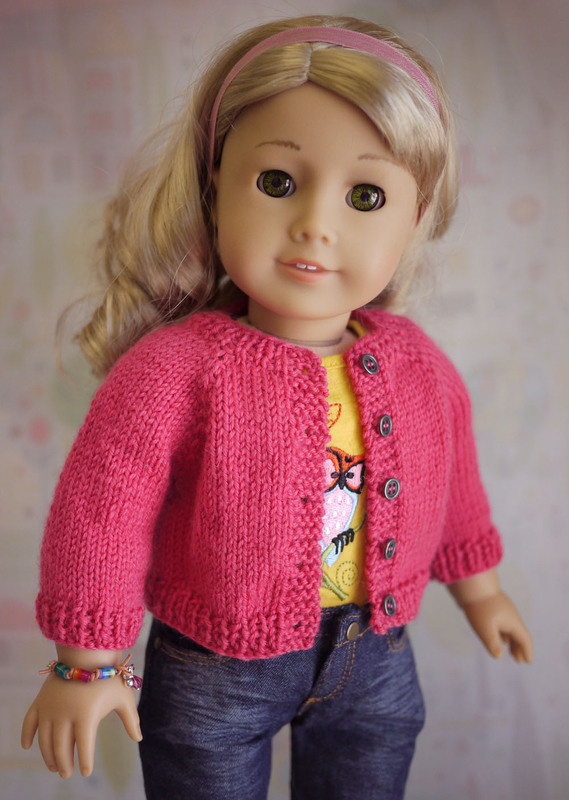 On your knitting for 18″doll the pink cardigan you have written k2tog is used for increasing! Beginners would find this a hard pattern to follow. It’s a great pattern nevertheless and my granddaughter Joanie will be thrilled by it for her new doll Jessica. I enjoy your pattern, but because I been knitting for years I understood your mistakes, thanks my granddaughter will love this for her doll and the matching one for her I made. ! Hi Cindy. Thank you for so generously sharing your pattern. Absolutely love love love it. Knitted up very quickly. Our grand daughters are getting OG 18″ dolls for Christmas so your pattern was an awesome find. You are welcome, Bev. I’m glad you found it easy to follow. The quick part is your doing, you must be a fast knitter. 🙂 What a special Christmas it will be for you with your granddaughters getting new dolls. That is always magical. Enjoy the holiday! Cindy , you work is fabulous. I especially love your embroidery work – fabulous! Thank you, Lora and thanks for visiting. Beautiful pattern. Thank you for sharing your talent with us! Thank you for the compliment. I hope you enjoy the pattern. You are so sweet. Thanks for taking the time to view my blog. If you do knit a sweater, I’d love to see it. I am working on this adorable sweater for my granddaughter and I have a question…you say beginning on row 5 “knit 2 together” for an increase – that is a decrease, so don’t you mean, “knit into the front and back of the stitch, for an increase”? Thank you, Victoria. Hope you enjoy it. Thank you for your nice comments, Lynn. Lovely dresses all shown together on the branch! Oh, I am so glad the pattern worked for you and your granddaughter loved her doll’s new sweater! That is so nice of you to let me know. Amelia Thimble is from wildeimagination.com. They are due to release a new basic doll this fall, but have Amelia as Tinkerbell in stock. Hi Cindy. Your work in stunning! Love it! Thanks so much for the free pattern. It is just what I was looking for. Your work is so amazing and I really enjoyed looking at the outfits you have sold. Thank you for taking the time to comment and your nice comments. I hope you enjoy knitting the cardigan. Each increase row should give you 8 extra stitches total, my counts in the pattern say you go from 65 stitches on r.5 to 73 stitches after completing r. 6. The link is in light blue underneath the photo on the Free Patterns page. Click on ag-cardi-pattern. Thanks for the pattern, I am up to the blocking, I had difficulty increasing with your method so I yo instead, it turned out real cute. I’m glad the pattern worked for you. Thanks for letting me know. Hope your doll enjoys her new sweater. I don’t have a doll ,its for my granddaughter. I hope she loves it, Jan. I still have things made by my grandmother and great grandmother that I treasure very much. Hi, Im in love with these dolls, I would like to buy some but I cant find the tab to adopt. Thank you, Mary. Happy to hear that you like it. Thank you for the free pattern, I like to knit in one piece. I just started knitting again, after 30+ years, for my granddaughters dolls. This is my FAVORITE pattern. So sweet of you to let me know. Thanks so much. I’m glad you are liking it! Thank you for this beautiful sweet shirt…..Love…love….pink, this is my favorite colour! Bye..bye…have nice week-end! My knitting skill is limited to scarves, but your pattern is so easy to follow and knits up so perfectly that I have made 4 cardigans in different colors. Thank you so much for sharing this wonderful pattern! I have tried to download 3 times, and all I get is copies of peoples comments. I love your website!!! Please tell me what I am doing wrong. Thank you! Click on ag-cardi-pattern link. This link is in grey and underlined. It is underneath the ******PLEASE note the correction… line of copy. I tried clicking on this and got my pattern in pdf form to appear. You can then print it out. I love the top-down sweaters, especially yours. I started putting each row on file cards so I don’t need to count rows. I type them on labels, number each label, and thumb through them as I work each row. Much easier to pick up work after a lull, too. Great tip, Melodie! I do this for lace patterns, it’s the only thing that works for me. I’ll remember your tip for other knitting too. Thanks for sharing. I haven’t knitted in years and when I did I was a novice, I hope I can do this!! I just got a doll that I think is very similar to an American girl doll. Wish me luck! Of course you can, but here’s a “Good Luck” wish just in case. In case you didn’t see it there’s an errata noted by the download link. You are increasing when beginning (to make room for the shoulders) the pattern with a Kf&b not decreasing (K2tog). I still need to think about those two terms; my brain wants to mix them up. If you have any questions, I’d be happy to help. Ah, I think I visited Galena once… many, many years ago. It seemed very far away. I often go north and south in IL, but not west! Go figure! Hope the knitting is coming along nicely. Wonderful, Jill!!! I am glad I could explain the process in an understandable format. Now you can whip out a dozen or more. lol! Aren’t little sweaters charming? I’ve always been attracted to miniature knitwear. Thank you for letting me know the pattern worked for you. Thanks for sharing your sweater. Wow, you are a MUCH looser knitter than I am! My sleeves naturally stretched to fit the arm as they were quite fitted. I can see where shaping is needed for a looser sleeve. I’ve started knitting the sleeves on DPNs too. I hate seaming. You will be a hero when your granddaughters get their doll clothes! They are adorable! My favorite is the red Christmas dress with faux fur. I have made two cardigans and working on the third. I love this pattern! Thank you so much for sharing. Sure wishing I had an Effner doll. Your designs are awesome! Thank you very much for this beautiful pattern. I made it in 4 different colors for my granddaughter AG. She love them. Thank you for the pattern, I’am so anxious to start it. Do you do patterns for the Willie Wishers dolls? I will let you know how I come out. You are so Blessed. Love to sew, knit, quilt and do Machine Embroidery also. Thank you so much for the free cardigan pattern with the absolutely awesome instructions. Best pattern ever!! Love that it has very little sewing up. You have beautiful models and their outfits are exquisite. I’m happy you enjoyed knitting from my pattern. Thank you for the compliment on my work and dolls. I have a lot of fun! Hope you’re having a great day, Bev. Hi, love the pattern my niece just got an American girl doll that looks like her and wants matching clothes. do you know of any matching patterns? Hi, Heika. There are some sewing patterns at pixiefaire.com. For knitting patterns I’d suggest Ravelry. What a fantastic pattern! Thank you so much for sharing. I love the way it’s all in one piece and involves very little sewing up. The instructions are so clear and detailed. I’ve just finished making a blue cardigan to match my granddaughter’s school uniform. Now, before I see up the sleeves, I’m going to have a go at the boxing technique which I’ve never heard of before. Thank you very much.